It’s been a while since I’ve done one of these, and it’s not for lack of trying, but because villains seemed to be getting smarter after the first few issues. 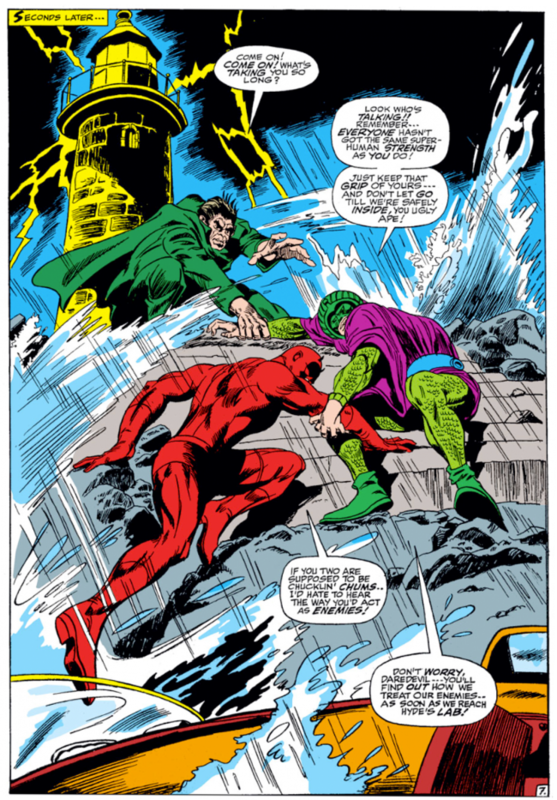 I had to keep browsing until Daredevil #32 (volume 1) before finding another solid example of a villain putting off killing Daredevil – due to megalomania or faulty logic – and giving our hero just the time he needs to escape. Matt learns that Mr. Hyde and the Cobra are on the loose after robbing a bank. Since the two were previously defeated by Thor, Matt decides that the best way to lure them out of hiding is to impersonate Thor. Matt, in his typical civilian blind lawyer garb, wanders in to the closest store that sells Thor costumes and picks one up. To create the perfect look, he also gets some skin-colored plastic to cover up his Daredevil costume. He even shows it off to Foggy and Karen, so we now have Matt pretending to be Mike, dressed as Daredevil pretending to be Thor. Still thinking this is a good idea, he hits the town, runs into the real Thor, and has a typical hero versus hero fight. Thor creates some kind of whirlwind with his hammer which peels the Thor costume off Daredevil’s body. Because Daredevil is heroic and one of the good guys and what not, Thor lets him go. Meanwhile. Mr. Hyde and the Cobra watch from some nearby hideout. Said villains attack a completely incompetent Daredevil and throw a blinding liquid in his face. Yes, you heard me, a blinding liquid. I think this is the fourth time this plot device has been used so far. Since Daredevil is already blind, this liquid dulls his other senses instead and bring them down to normal levels. And yes, I know, this makes no sense whatsoever. Daredevil spends literally hours stumbling home across town before realizing that he could have simply hailed a cab. Upon realizing this, he hails a cab. The entire time leading up to this realization, he tries his best not to let the world know that Daredevil has gone blind. He makes the completely nonsensical decision to try to convince Foggy and Karen that Mike Murdock is now also blind. There is no reason for doing this. No one knows Daredevil is blind at this point, the people watching him stumble home from his encounter with Mr. Hyde and Cobra think he just had a rough fight. Karen and Foggy don’t even know about this. The logical decision would have been to just go in as Matt Murdock. Sure, he would have had the problem of being totally non-superpowered blind rather than “Daredevil blind,” but he could have blamed that on a hang-over, a migraine or just having a bad day. Instead, he blames his sudden blindness on a hereditary weakness of the eyes. Matt lost his sight in an accident. Foggy knows this. To make matters worse, Mr. Hyde and Cobra have shown up and are threatening the crowd below with a huge boulder of some sort. Matt – as Mike – suits up as Daredevil and asks Foggy to help him outside. Without his sight, nor his heightened senses, he will attempt to get to where the villains are by walking a tightrope from their own building to the next, using his billy club line as the rope. Why does he do this? To prove to the villains that he’s not blind. A better idea might have been to stay inside. Because of his acrobatic skills, he actually does convince Mr. Hyde and Cobra that he’s not blind. The excuse is always the same, isn’t it? “Now is not a good time,” “This is not a good place.” In this case, Hyde decides that his lab is a better place. Knowing that one of the keys to being a successful supervillain is a highly exotic hide-out, Mr. Hyde has decided to house his lab in an abandoned old lighthouse. To make the scene complete, the trio approach the lighthouse on one of those famous “dark and stormy nights.” Which brings us to the following scene. They couldn’t just push him against the rocks and be done with it? 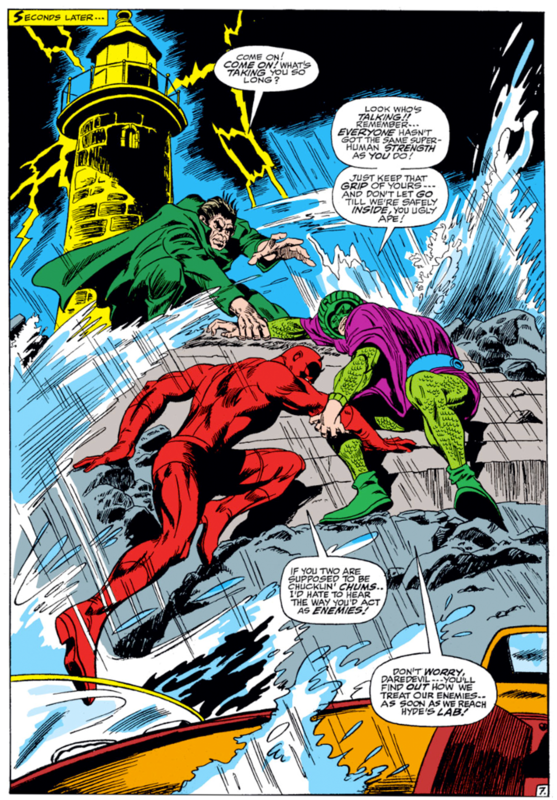 Daredevil is lead to the top of the lighthouse where his doom awaits him. When Mr. Hyde instructs Cobra to go get “the cables” Daredevil deduces that whatever they’re planning involves electricity. Using this nugget of information, Daredevil assumes there must be a generator somewhere for him to shut off. I don’t know why there would have to be. There’s a frickin’ thunderstorm raging outside, complete with lightning! Soon, there’s a full-blown fight fest, with everyone throwing punches left and right. Daredevil finaly finds a bottle on the floor, which just happens to be the antidote. He downs the whole thing, immediately regaining his senses. The issue ends with Daredevil back in form, and the two baddies on the run. The reader is left wondering how someone can be smart enough to develop a magic blinding potion and a perfect antidote, yet completely unable to kill a blind guy in pajamas. Thank God for stupid villains! Keep the kids away from Matt Murdock! Still just a nomameter into the new year! This is probably my favourite convoluted acts of non-killing by DD villains. Classic stuff. Best wishes on the new site – I’ll try and keep up! This specific storyarc is what I like to call “the Bible of Preposterous Plot Points”. Also, I predict that Mr Hyde is probably the villain with the most “acts of non killing” on his account. Thanks for commenting, guys! What I think you really get from this, and many other stories that Stan Lee and the other comic book creators of this era put together, is just how much fun they were having. It’s not as if they don’t know that it’s nutty. They just don’t care. If you can think it, you can write it, package it, and sell it. Hopefully, the readers will enjoy the fun of it just as much. It’s a nuttiness I think would be very unwise to try to recreate today, but at the time readers may have been more forgiving of lapses in logic. Having said that, I think the Mike Murdock era in general, and this story arc in particular, may have been among the strangest and most far-fetched stories out there. This post cracked me up. I must say however Gene Colan was, and is, an amassing artist. Hah! I love the Stan Lee villain teamups; the villains always spend more time squabbling with each other than they do defeating the hero. I’m adding this to today’s roundup post!